I am not a "card-man", even though I can watch and admire biddies, seconds, tops, bottoms, middles and injogs. I suppose the reason why I don't do these things myself is because I can't! However, I have on occasion got quite a bit of fun out of a pack of pasteboards, and I like to think that my audiences have too! 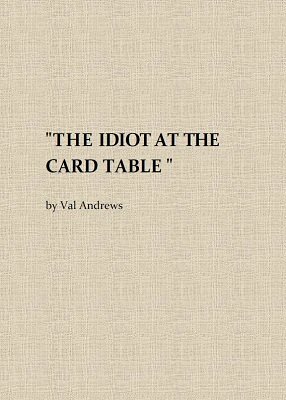 So here are a few stunts, gags and tricks for the card-man who does not take himself too seriously. If you hear a slight whirring noise whilst you are reading this book, it will be Mr. W. Erdnase. . . revolving! With a reel. . . ."The Sporting Gambler"
Can't do it with Cards. . .
Electric Pack Gag. . . The Hard Way. . . The rising card. I COULD do that! For bald-headed idiots only. . .
For Magicians only. . .
1st digital edition 2012, 15 pages.